The White-faced is native to tropical Central and Southern America and Africa south of the Sahara and including Madagascar. It is very gregarious and vocal and the sight and sound of a flock moving at dawn or dusk between feeding and roosting areas really is impressive and a memory that will remain with you for a long while. White-faced are potentially the most colourful of the whistling-duck tribe and consequently they are a very popular addition to any collection and being social they work very well in groups when their interactions can provide hours of pleasure. As with all whistling-ducks and particularly so with white-faced they become exceptionally tame and the white-faced call really can be described as a whistle. As you approach your waterfowl enclosure if you whistle you will very quickly find that your white-faced will whistle in response that is always great fun. White-faced are very easy to care for and thrive on wheat and pellets but also really enjoy the addition of some millet seed, this is not essential but they really enjoy it and it is a very easy way of getting your white-faced really tame. All members of the Whistling-duck tribe readily interbreed but I do not think there have been any hybrids with other species. 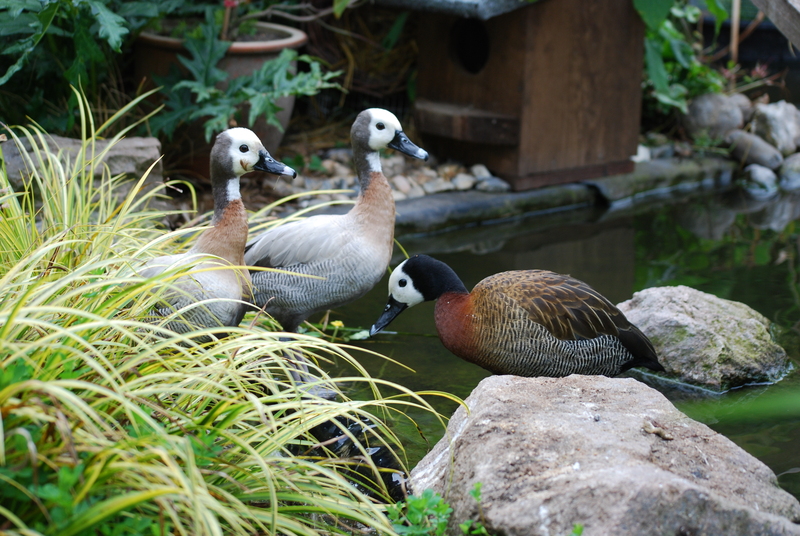 Fortunately whistling-ducks form very strong pair bonds and providing care is taken it is possible to maintain a number of different whistling-duck species in the same enclosure. However if you see signs of pairing between two species then you need to act quickly because whistling ducks appear to voice bond and if once a bond has become established it is difficult to break unless you can separate them so they are also out of earshot. White-faced are considered one of the easiest and hardiest of the whistling-ducks, easiest yes, but I am not sure that I would agree with the hardiness. If you cannot be sure that you will have open water during severe winter weather then I would strongly recommend the provision of some protection at the pond edge. This can be very simple and provided a small area can be covered so that the white-faced can stand on some straw or wood shavings to give them some insulation from the freezing ground they should be fine. Alternatively it may be easier to just put the white-faced inside if the weather turns really severe. White-faced can certainly breed in their first year but regularly do not breed until they are two. They have a long breeding season and once they have started breeding they can usually be relied upon to produce three clutches of between ten and fourteen chalky white eggs that take about twenty seven days to hatch. They will readily nest in natural cover but are equally happy with a variety of ground nest boxes and really like using willow duck nesting baskets placed in long grass or a clump of iris. As with all the whistling-ducks the male and female share incubation so the eggs are never left unattended once incubation has started and consequently whistling-ducks do not add any down to the nest. Both the male and female assist with brood rearing and consequently the whistling-ducks tend to be more successful that most other waterfowl if left to parent rear. As with all the whistling-ducks the ducklings are relatively easy to artificially rear in a brooder on the usual crumb diet, from hatching the ducklings are very tame. While proving difficult to establish a new and exciting silver mutation of the White-faced has occurred. This is very striking and when established in viable numbers will doubtless prove very popular. Adult normal and silver White faced. Male silver and normal female at nest site. Two day old White faced ducklings.